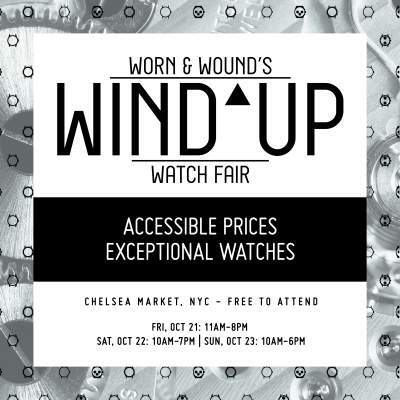 On October 21, 2016, worn&wound, the leading resource for watch news and commentary on well-crafted, value-driven timepieces from independent watch brands around the world, will open the doors to the 2nd annual Wind-Up watch fair in the iconic Chelsea Market. worn&wound’s Wind-Up, which is free and open to the public, is a three-day watch culture event featuring a range of curated brands, accessories and ephemera. Coming back to New York City for its second year, it offers an exciting and engaging environment, encouraging everyone from seasoned fans, to first-time buyers, to curious passersby to come in, take a look and talk watches. In addition to the full weekend exhibitions, special promotions and activations will be featured throughout the fair including a book signing by international author and Amazon bestseller, Aaron Sigmond, for his latest release- Drive Time, a special Autodromo edition, live watchmaking demo hosted by Horage, live hand-painting custom made dials by Schmutz Watches, special visit and presentation by Thilo Mühle, CEO of Mühle Glashutte, and sales and giveaways sponsored by Brew, LÜM-TEC, Martenero, Oak & Oscar, Schmutz, Sablier, and more.